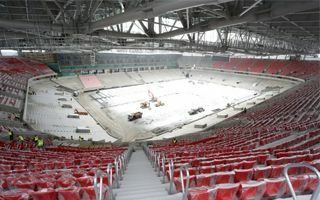 Moscow: Ukrainian crisis to affect Otkritie Arena's opening? Already in July Russia's largest private stadium is to be opened. And though owner Leonid Fedun assures he still plans to welcome „Soviet derby” rivals Dynamo Kyiv, Ukrainians aren't keen on coming. In February Spartak Moscow and Dynamo Kyiv announced they're most likely to meet for Otkritie Arena's opening, reviving the tradition of one of USSR's most important football derbies. The friendly game scheduled for July is still hoped to take place by Spartak. Leonid Fedun, the billionaire behind Spartak and the new stadium, assured on Friday he issued an application to the Ukrainian FA to allow the game. But while Spartak confirm readiness to accept the Ukrainian classic rivals, in Ukraine the mood is much more cautious. Recently a Dynamo fanclub appealed to the club to refuse the Moscow visit, fearing provocations in the stands may spoil the football festivity. Also Dynamo president Ihor Surkis commented that he finds a potential Moscow friendly very inappropriate at this time, while his country is deconstructed by Russia in violation of international law.